©BNP/BANDAI, NAS, TV TOKYO *Images may differ from final product. *Product may be subject to change. 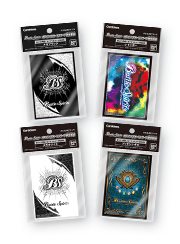 A new series of hologram card sleeves! 4 colors are available, with an easy-to-use cardback design! Keep your cards safe in sleeves as you battle! On sale Late April 2018! * Images may differ from final product. * Product may be subject to change.